The first update for Google Presentations doesn't include the export to PowerPoint format, as one might expected. Instead we get some minor improvements for managing and customizing the slides. Now you can select more than one slide at a time: press Ctrl while selecting disparate slides and Shift for continous selections. 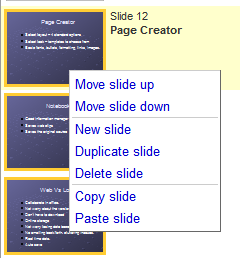 The slides can be moved using drag&drop and copied by selecting the options from the contextual menu. While there's still no option for custom themes, you can change the background by uploading an image or selecting a color. 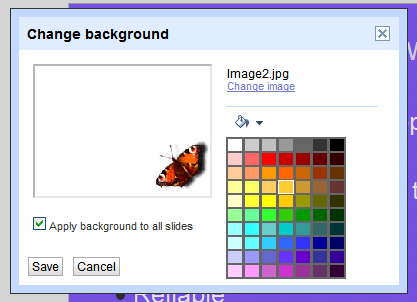 Right-click on a slide and select "Change theme". Google recommends to use 800x600 images or at least images with an aspect ratio of 4:3. For the end, here's a simple way to import a PPT attachment from Gmail to Google Docs: right-click on the "View as slideshow" link, copy the link location, paste it in the address bar and replace "disp=vgp&view=att" with "disp=attd&view=wtatt". When Google Presentations becomes more powerful, this tip will probably be unnecessary.